What conditions does Imitrex treat? 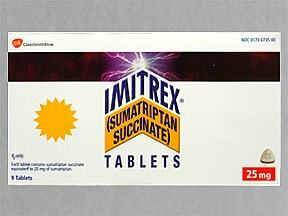 Sumatriptan can commonly cause chest/jaw/neck tightness, pain, or pressure that is usually not serious. However, these side effects are like symptoms of a heart attack, which may include chest/jaw/left arm pain, shortness of breath, or unusual sweating. Get medical help right away if these or other seriousfast/irregular heartbeat, fainting, severe stomach/abdominal pain, bloody diarrhea, seizure, signs of a stroke (such as weakness on one side of the body, trouble speaking, sudden vision changes, confusion). List Imitrex side effects by likelihood and severity. What should I know regarding pregnancy, nursing and administering Imitrex to children or the elderly? Does Imitrex interact with other medications? This medicine is a white, triangular, film-coated, tablet imprinted with "I" and "25". 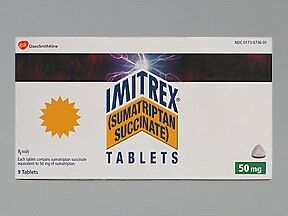 This medicine is a white, triangular, film-coated, tablet imprinted with "IMITREX 50" and "logo". 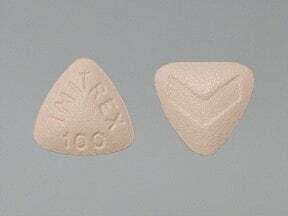 This medicine is a pink, triangular, film-coated, tablet imprinted with "IMITREX 100" and "logo". 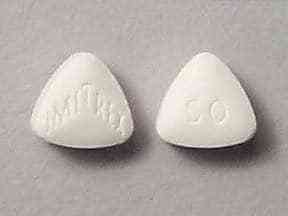 This medicine is a white, triangular, film-coated, tablet imprinted with "IMITREX" and "50". 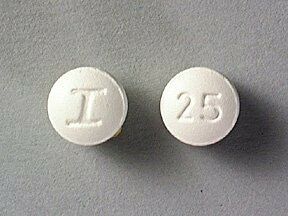 This medicine is a white, round, film-coated, tablet imprinted with "I" and "25". Are you considering switching to Imitrex? How long have you been taking Imitrex?